How in the world are we approaching the end of August? And Labor Day? This summer went by waaaay too fast. I realize we still have a few official weeks left, but Labor Day always signifies the end for me. One thing that is NOT ending anytime soon is my obsession with the incredible summer produce. We have been eating our weight in fresh corn and juicy tomatoes for weeks now, and I don’t want it to stop! 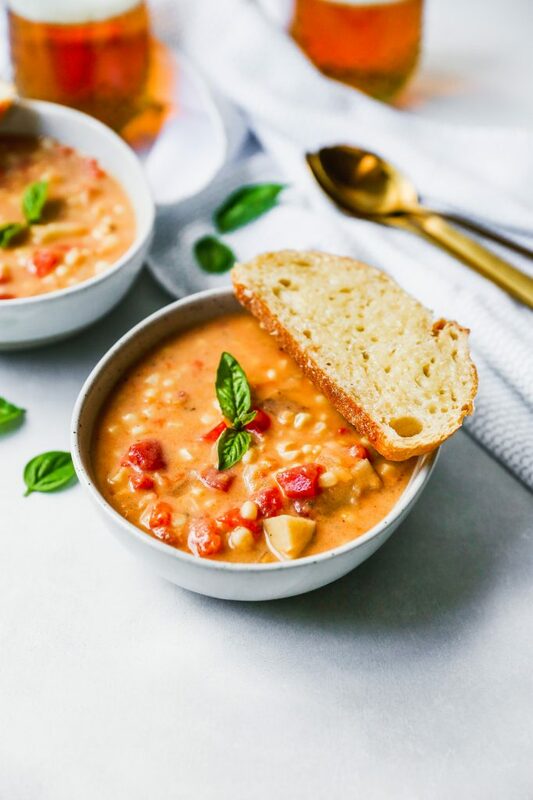 Today’s soup is an example of me embracing the impending fall weather (I’m not-so-secretly so excited for fall. Can’t help it!) while still clutching to the bounty of summer! 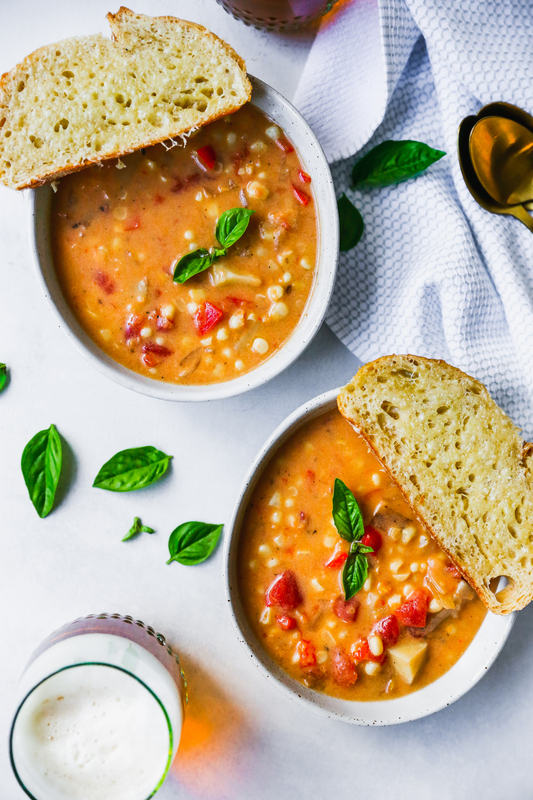 Soup in summer is not new around here. 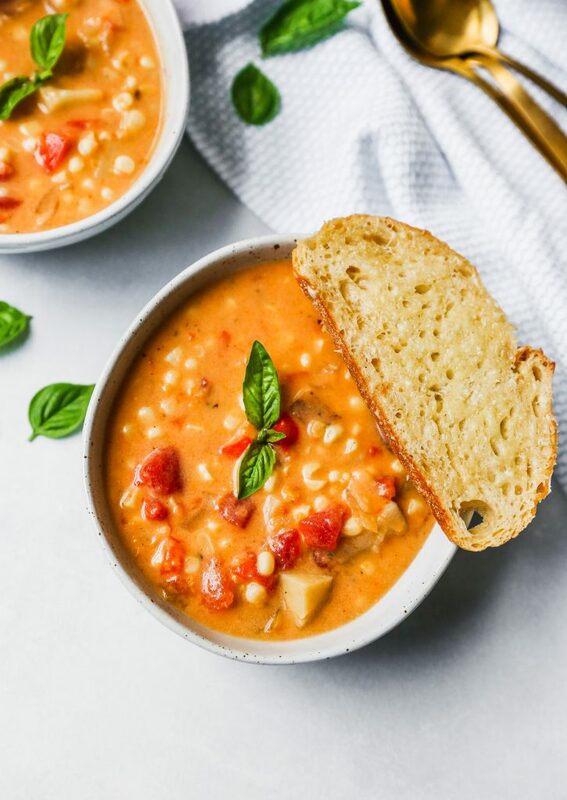 In fact, every year around this time, I share a soup recipe. Or a couple soup recipes. Mostly centered around corn! Because it is my fave and the absolute best this time of year. This summer ramen is fantastic. 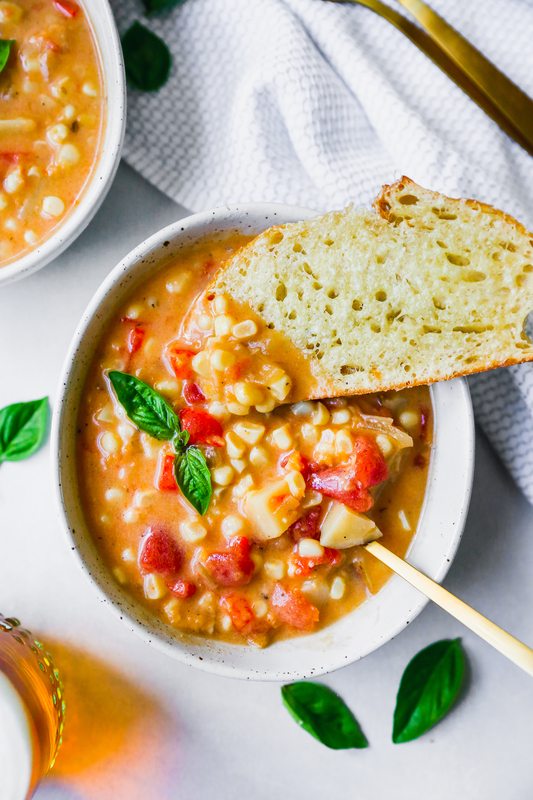 And this buffalo corn chowder is to die for (I just made this a couple weeks ago!). 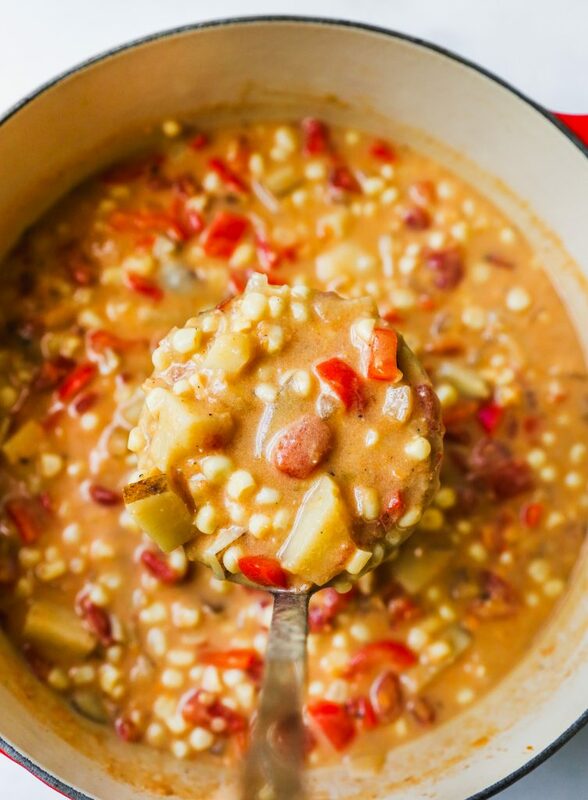 Oh and this corn and potato soup is so hearty and delish. THIS ramen is the most popular recipe on the blog, no matter what time of year it is, which just goes to show you that I’m not the only weirdo out there who likes soup in August. It doesn’t even feature summer ingredients! It was born out of an insane pregnancy craving several years ago, and it might be one of the best things to come out of my kitchen. Like, ever. Clearly, there is a trend. I like soup. All year! And today’s recipe is a celebration of just that. 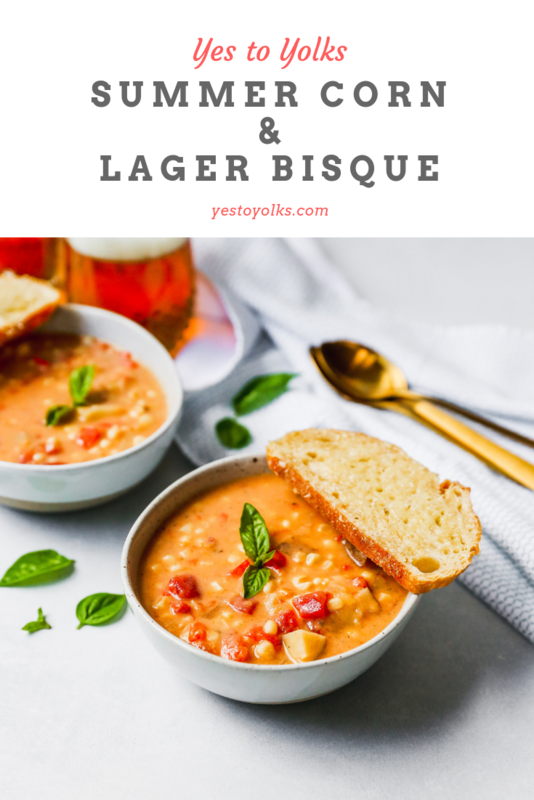 Fresh corn, lots of veggies, aromatic spices, tomatoes, and some hearty beer make this bisque something really special. 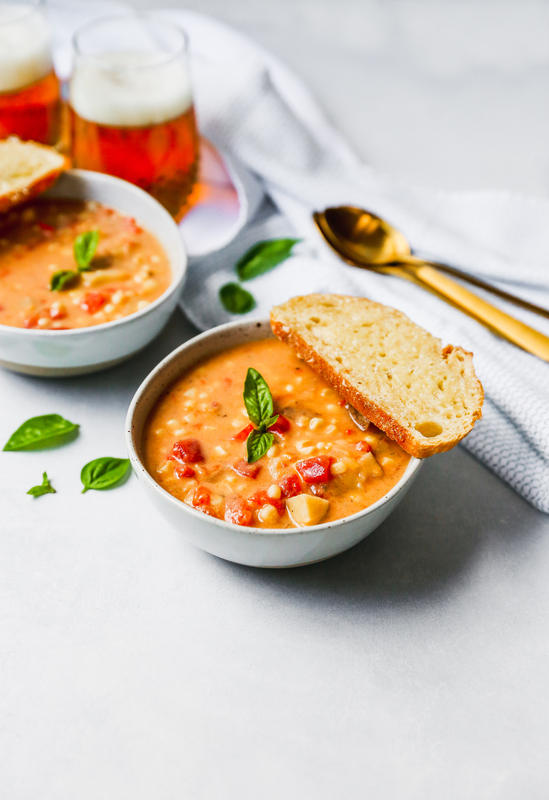 It is hearty, sweet, and savory all at once, and it is one of those soups that Dan deems acceptable as a meal (he usually wants soup as an appetizer only). All the goodness gets simmered until thickened and lovely. And then I top each steaming bowl off with a crispy, cheesy crouton. Well, if you consider a large slice of bread a crouton, hah. Go big or go home, right? The croutons are toasted in the oven with a little olive oil and salt. Then they get a generous grating of gruyere cheese (which goes swimmingly with both beer and corn, by the way) and my life is officially made. This, friends, is summer at its best. Soup and all! In a large pot, heat the oil and butter over medium heat. Add the onion and red bell pepper and saute for 5 minutes. Add the garlic and spices and stir to combine. Cook for another minute to warm up the spices. Add the flour and stir until everything is evenly coated in the flour. Cook for 1-2 minutes, stirring frequently. Slowly stream in the beer and cook until it is mostly reduced, about 5 minutes. Add the diced tomatoes and stock and bring the mixture to a simmer. Once the liquid is simmering, add the potatoes. Simmer for 15-20 minutes or until the potatoes are very tender. Add in the corn and half-and-half and stir to combine. Cook for another 10 minutes. Season, to taste, with salt and pepper. Preheat the oven to 350°F and line a small baking sheet with foil. Spread the sliced bread out in an even layer, drizzle with olive oil, and season with salt and pepper. Place the pan in the hot oven and bake for 5-7 minutes or until the bread is beginning to toast. Remove the pan from the oven and carefully top each piece of bread with some of the grated cheese. Return the pan to the oven and bake for another 2-3 minutes or until the cheese is melted and bubbly. Ladle the soup into bowls and top each with one of the gruyere croutons. Garnish with fresh basil and serve immediately. 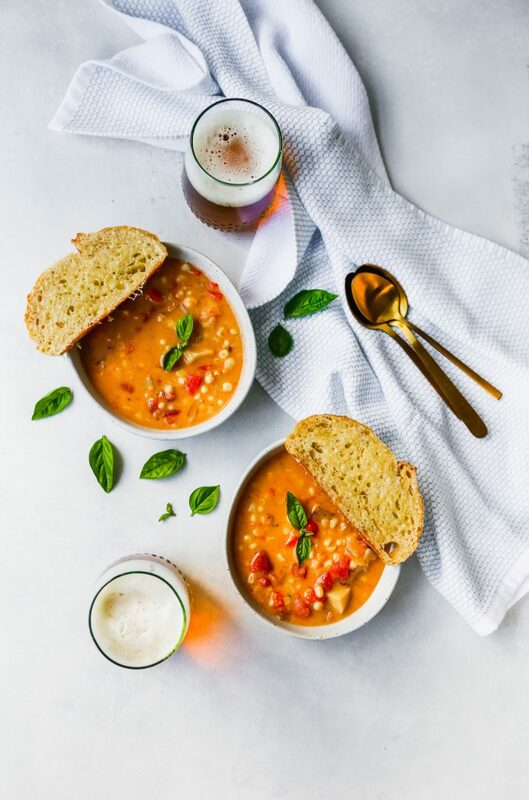 If you don’t want to use beer in this soup, sub it out for another 1½ cups of vegetable stock.